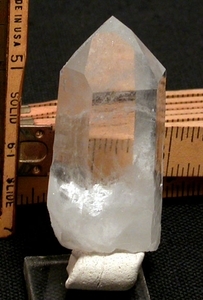 7/8x 1-1/8x 2-15/16" tall, a strong trans-channeling Arkansas crystal for your consideration features a perfect termination, raised record keepers and preferentially, lightly sparkled facets. Devic veils appear to form a dancer, a cross, or perhaps a tree. Below deeper sparkling veils are a rainbow penetrator and regrowing base [Hera]. Trans-channeling crystals are said to both send and receive information and energy - you may have your choice with this stone, and read through its' clarity, too!